Applications have been submitted to replace the ugly length of frontage at 10 Bullring with a traditional shop front. The intention is that the former bank will become a shop. There is no information on whether a retailer has been secured for the building and it is still advertised for let. These plans look good to me. They will remove an eyesore from one of our historic streets. The building is Grade II listed and within Ludlow conservation area. Very little of the original Arts and Crafts style structure remains. The frontage is dated 1836 and 1903 over the door, and its style is in keeping with the later date. The extension between the bank and Rickards is a late 20th century horror. Under the plans, the historic frontage of the original listed building will remain (17/05186/FUL; 17/05187/LBC). 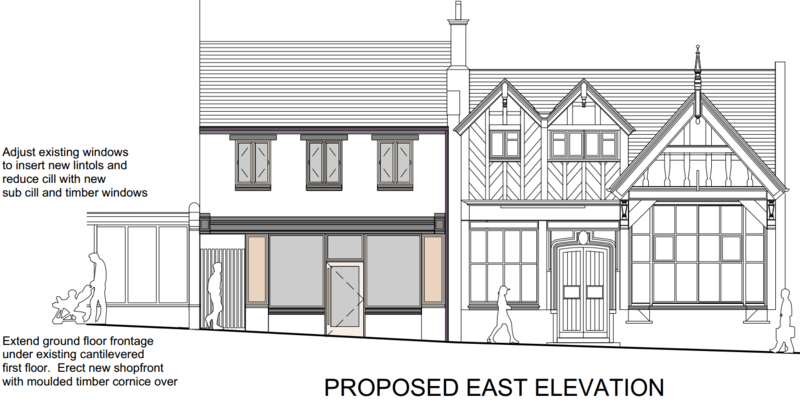 The late 20th century frontage will be replaced by a traditional shopfront. Internal partitions erected during the building’s time as a bank will be removed. I am pleased this building will be improved. The 1903 frontage is part of the historic fabric of the Bullring and has some echoes of the Feathers Hotel opposite. I am pleased also that the applicant, Lloyds of Ludlow, is applying for a change of use to class A1. That covers shops and retail units. 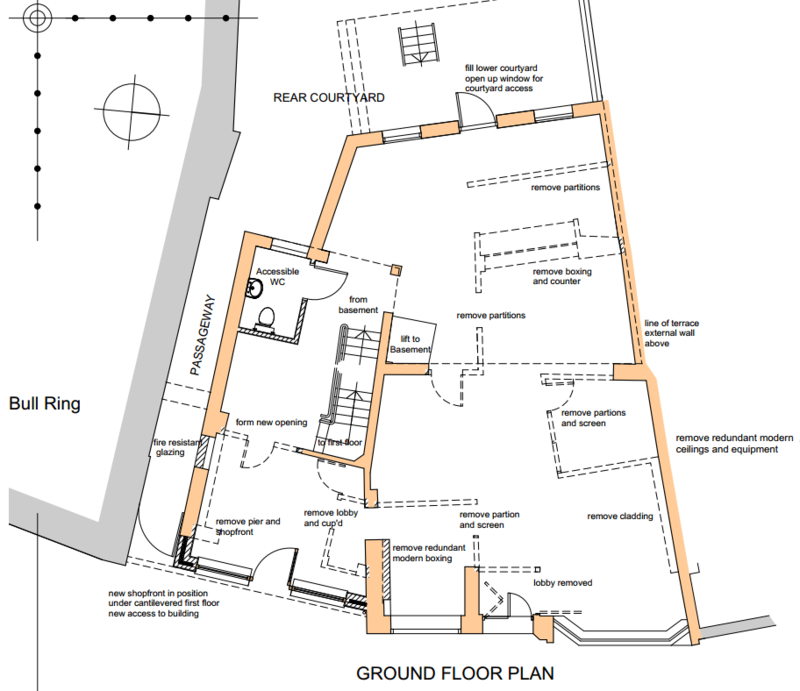 It suggests that the building will not end up as a café, eatery or takeaway, which would be use class A3. But that could be changed on a subsequent application. Thoughts of a replacement Post Office come to mind. It might be just in time.